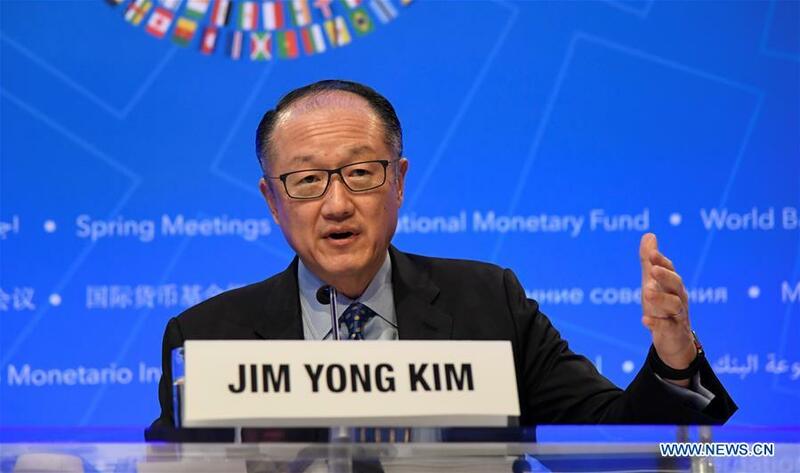 World Bank Group (WBG) President Jim Yong Kim announced on Monday that he will be stepping down from his position after more than six years at the international lending institution. World Bank CEO Kristalina Georgieva will assume the role of interim president effective Feb. 1, the World Bank said in a statement. Kim's resignation from the World Bank came unexpected as he was appointed to a second five-year term as president of the multilateral development bank in 2016. Kim first became the 12th president of the World Bank on July 1, 2012. Before this post, he served as president of the famous U.S. academic institution Dartmouth College. "The work of the World Bank Group is more important now than ever as the aspirations of the poor rise all over the world, and problems like climate change, pandemics, famine and refugees continue to grow in both their scale and complexity," Kim said Monday in a statement. "Serving as President and helping position the institution squarely in the middle of all these challenges has been a great privilege," he said. Immediately after his departure, Kim will join a firm and focus on increasing infrastructure investments in developing countries, the World Bank said, adding the details of this new position will be announced shortly. During his tenure at the World Bank, Kim has reinforced the growing partnership with China in the areas of poverty reduction, development finance, infrastructure investment, and the Belt and Road Initiative (BRI). "We are now working with China on international development issues, through the World Bank's International Development Association, through South-South learning initiatives, through China's international development initiatives such as China-Africa cooperation," Kim told Xinhua in an exclusive interview in late October. Kim also said the World Bank is "well positioned" to support BRI projects with its experience in similar trade and connectivity projects, its unique institutional setup covering private and public sectors, and its range of financial and non-financial services such as guarantees and settlement of investment disputes. "The WBG can, for instance, advise on the economic viability of infrastructure investments, complementary policy and regulatory reforms, and the application of environmental, social and fiduciary standards," he said. Reflecting on China's reform and opening-up over the past 40 years, Kim said that has transformed the country into the world's second largest economy and provided valuable lessons for other developing countries to achieve economic success and alleviate poverty. "Understanding the path China traveled, historical decisions made, and their effects on the course of China's economy can inform decision makers hoping to achieve similar outcomes in their countries and for their populations," he said. World Bank Group (WBG) President Jim Yong Kim announced on Monday that he will be stepping down from his position on Feb. 1.